Mao Zedong suffered a massive heart attack on September 2, 1976. His doctors kept him alive until 9/9, a more auspicious day. The number 9 had always been associated with their divine emperors and Mao was China’s modern God. Although he had said he wanted to be cremated and used as fertilizer, the new leaders wanted him embalmed and put on display like the other great Communists, Lenin and Ho Chi Min. Unfortunately it seems his doctors did not have the proper technology and his face fell off. Luckily the Vietnamese came and helped them out. I left everything in the car except my driver’s license and a few hundred kuai before joined the queue to enter his mausoleum. You are not allowed to bring bags or cameras. There are lots of instructions… no talking, no photos, no hats, be respectful, move quickly, no stopping and no lighters. Armed guards and stern men in black suits with white gloves hover everywhere keeping an eye on the crowd. “Volunteers” from all over China constructed the building quite quickly. The workforce included representatives of all the different minority groups. It was inaugurated in September 1977, only a year after his death. I was lucky the line was short and moved quickly. After a quick pat down in security where hundreds of lighters were being seized, (people still smoke a lot here) you are given the opportunity to buy carnations before heading up the stairs into the building. They are resold up to 30 times a day. Flowers are left in front of a huge statue of a seated Mao (looking just like Lincoln in his monument in Washington). 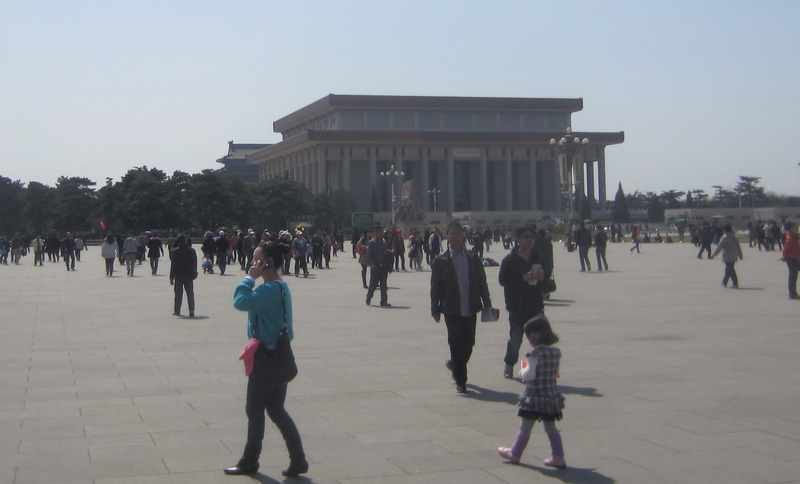 The crowd then moves, single file, to the left or right, around the corner to where Mao lies. He is displayed in a glass coffin that is raised up from the basement in the morning. At closing time, he is lowered back down into a refrigerated vault to help preserve the body. 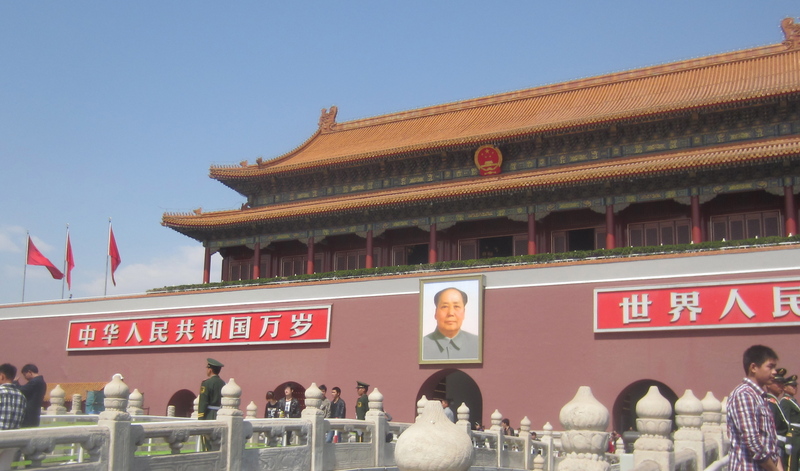 Mao remains a controversial and fascinating figure 36 years after his death. Reviled in much of the world, the official line in China, as stated by Deng Xiaoping, is that he was 70% right and 30% wrong. Growing up in New Jersey I learned he was one of the bad guys. And, turns out when my mother said eat all your dinner, there are people starving in China, she was right! But, Mao is not hated everywhere. Rebels in Peru, Nepal and India still claim to be Maoists following his doctrine of peasant revolt. He has been heralded as a genius in guerrilla warfare and as a military strategist. He was also a master propagandist. Unfortunately, he wasn’t very good at running a country. Mao parted from traditional Marxist thought. The peasants, rather than the workers powered his revolution. His fans credit him with increasing the number of people who went to school and providing the Chinese people with housing and health care. They claim he abolished unemployment and increased life expectancy. He tried to make China self-sufficient and give people back their dignity and pride. On the flip side, in January 1958, his Great Leap Forward (or second five year plan) devastated the economy and caused the largest famine in human history. 25 to 30 million people starved to death. When threatened with loss of power after this disaster, he used his propaganda skill to start the Cultural Revolution. In 1966 he appealed to students to rise up against their teachers, their parents, China’s leaders (other than himself) and start a permanent revolution. Millions more were killed and untold numbers of precious treasures were destroyed. It lasted 10 years until his death. He looked pretty good lying there. A bit orange. Rumour has it he is actually made of wax. Or that there are two bodies, the real one and a wax one and that you never know which one is on display. Every Beijinger I asked about this denied it vehemently. The crowd, all Chinese except for us, looked impressed, reverent and moved. 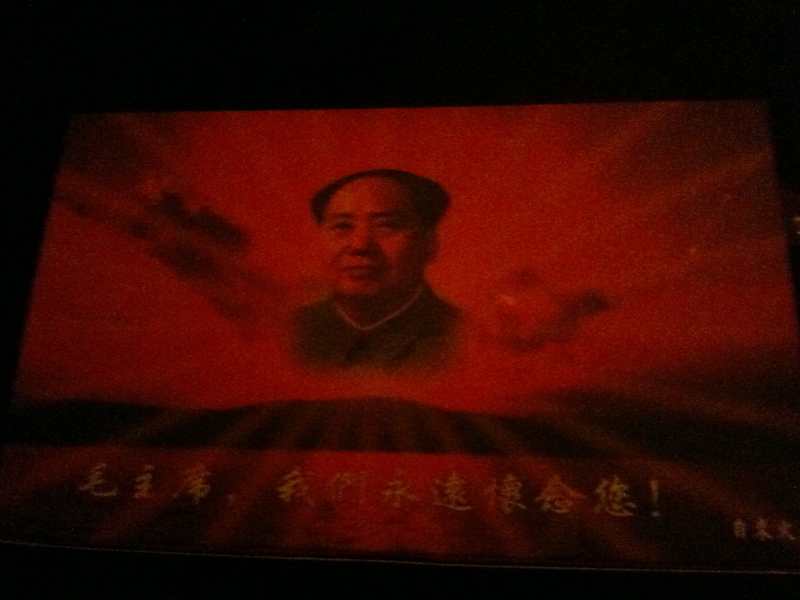 But I suspect they are more cynical than they looked… most common people now say Mao was 70% wrong and only 30% right! They also looked a lot less solemn as they dug through the box of lighters near the exit scavenging for the best one to replace their one confiscated at the entrance.